Jas Takhar is on the hunt for a new Luxury car. The Toronto real estate agent has been renting cars since the lease on his vehicle expired two months ago so he can take his time to pick the right brand. The 36-year-old car enthusiast said he’s been eagerly awaiting next week’s Toronto auto show to help him decide. With a budget of $95,000, he’s considering brands like Audi, BMW, Lexus and Mercedes-Benz. Takhar is one of many Canadians who are spending more to go upmarket into the luxury car segment. Analysts said a combination of a strong economy with good job growth, affordable financing and more new vehicles on the market has led the luxury segment to outpace sales growth in the overall auto sector in recent years. “It’s not a huge piece of the overall market, but it has been growing more rapidly than overall vehicle sales, which of course on the whole, has been setting records for five consecutive years now,” said Michael Hatch, chief economist at the Canadian Automobile Dealers Association (CADA). For the first time ever, car sales in Canada reached a record 2.04 million units last year. That is a 4.6 per cent increase from 2016, which places Canada third among G7 countries for sales growth. Luxury vehicles accounted for almost 12 per cent of 2017 sales in Canada, up from 11 per cent in 2016 and nine per cent in 2013, according to Scotiabank. Analysts expect strong sales of luxury cars to continue and gain more market share as growth in the overall car market stabilizes. “If overall sales are flat this year, it will still be good growth on the luxury side,” Hatch said. Scotiabank estimates overall car sales of 2.0 million in 2018. While a forecast for the luxury market wasn’t available from Scotiabank, new luxury sales is forecast by Desrosiers Automotive Consultants to climb 7 per cent in 2018. Paul Cummings, CEO of Grand Touring Automobiles in Toronto, said “super luxury” brands like Bentley, Lamborghini and Rolls-Royce saw over 10 per cent sales growth at his luxury dealership last year and he expects this to continue with a strong economy. “First, it appears that the Canadian economy will continue to grow; second, our manufacturers have new product offerings arriving this year; and third, we have invested in new facilities that will provide greater accessibility/capacity to our customers,” he said. With Canada’s economy expected to grow 2.3 per cent this year, global luxury automakers are continuing to roll out new models and brands in the country. Some notable ones include the world’s bestselling luxury carmaker Mercedes-Benz expanding its lineup to introduce the A-Class hatchback this year, while Italian brand Maserati will roll out its entire 2018 all-wheel-drive lineup after seeing an 80 per cent jump in sales in Canada last year. But even with a booming luxury car market, analysts warn that one of the biggest challenges facing the sector is the prospect of higher interest rates. Hatch of CADA said the luxury side of the market had been more insulated from some negative economic shocks that have occurred because at the super high end of the market, consumers can still afford to pay higher borrowing costs. “But, it’s possible that fewer people will be in a position to move upmarket in a higher rate environment,” he added. Cummings, meanwhile, expects sales at his dealership to be affected by higher rates as manufacturers and banks keep an eye on the level of consumer debt. “If the cost of [borrowing] money goes up and you finance or lease your car, typically the payment will move up as well,” he said. Canadian household debt as a share of disposable income hit a record high in the third quarter of 2017, according to data from Statistics Canada. Canadians owe $1.71 for every dollar of disposable income they had in the third quarter. Economists have warned that consumers could run into trouble as interest rates rise. But that won’t deter Takhar from buying his luxury car as early as this month. “I’ve budgeted for a hike in rates,” the father of two said. 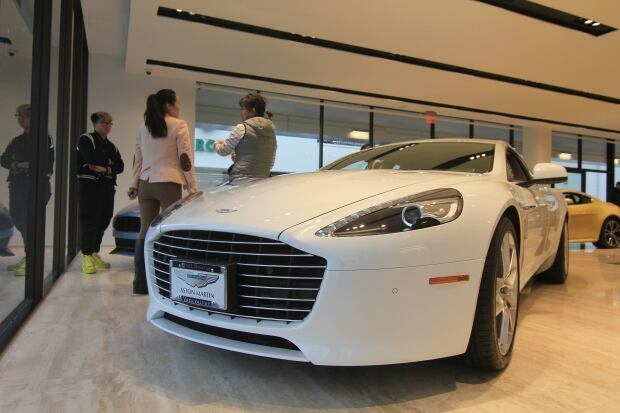 The post Luxury Vehicle Sales in Canada still booming but higher interest rates could pose challenge appeared first on JuiceeNews.